Is Your Furnace Making Strange Sounds? If you are poking around heating blogs this time of year, you are probably going to encounter quite a few posts telling you what to look out for in terms of red flags that your system is in trouble. There is a lot of good information to be gleaned from such posts. Just remember, though, that it’s not all about looking for signs of trouble. Listen for signs that you need heating repair in Kerrville, TX, as well! If your furnace is making a lot of strange sounds, or if it is making its usual operating sounds at a much higher volume than usual, then that furnace is in trouble! It is trying to tell you that the time for professional heating repairs has come. If you ignore what your furnace tries to tell you, you cannot blame it when it gives out on you just when you need it most! Dial our number at the first sign of trouble, audible or otherwise, and we’ll have your furnace right back on track. No, not in the slang sense of a booming operation that keeps your home very warm and comfortable. We mean literally booming. If so, then you could have an issue with delayed combustion. Too much gas is building up in the combustion chamber, that gas is combusted all at once, and a loud boom follows. Natural gas is a great resource. It is still a combustible fuel, though. You need to know for certain that you are using natural gas safely in your home. That is why you need to contact us if you encounter this problem with your furnace. Heat your home safely! If so, there may be moving parts in there that need some lubrication. That is very likely a metal on metal sound. It’s not quite as alarming as that loud screeching might suggest. However, if you fail to have the problem addressed in a timely manner, your system could face damages. It could also be the result of worn out belts. Again, this is not necessarily a huge problem. Changing a belt is pretty straightforward for a trained technician. If you wait for that belt to snap before scheduling service, though, you are going to be without your heater until a new one is put in place. 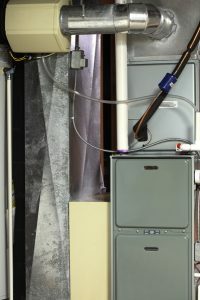 Is Your Furnace Banging and Clanging? Then you really need to reach out to a member of our team immediately. The most likely cause of this issue is a loose component in the heater. Even if the furnace is still up and running, there is a serious risk of damage if you ignore this problem. Your blower mount may have worked loose, or there could even be screws bouncing around there. Bent fan blades could also be to blame. Whatever the case, your system is not going to function as efficiently as it should, and it is definitely at increased risk of damage so long as the problem persists. Schedule your furnace services with D’Spain Sales & Service, Inc.
Why Is My Heater Starting and Stopping So Frequently?